Instantly light up your lampshade with our Clip On Light System. Can be used on the table, or clip on to a shelf, Only £3.60 each. Can be used without lampshades as a spotlight, great for temporary lighting. Suitable for use with bulbs with a maximum power rating of 60W max. 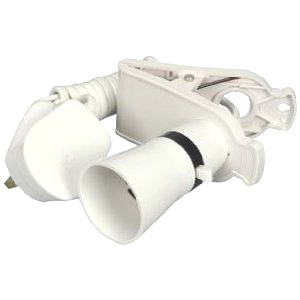 Simple to use, Insert Bulb and plug straight into your existing 13amp socket.